SteamBath Factory "The Wizard's Pipe" review! Right, I'll try my hand at a full soap review now that I have the time! Scent Profile According to IB site: Steambath Factory's The Wizard’s Pipe Shaving Soap is a spicy blend of cherry with a base of burning pipe tobacco. It is not an overly sweet cherry scent, and although the cherry note is certainly there it also has a strong tobacco accord with a smouldering character. This soap is named after the great grey wizard himself, who loved to smoke his long pipe while musing about happenings in the Shire. This soap, hrm... has it's good and bad points, but the bad is more personal, I'll try and explain. First, the scent; AMAZING! lol I love a good pipe tobacco scent, even though I don't personally smoke lol This soap provides a great scent for those of us who love that type of scent, and the cherry sweetness just adds to the background of it. The cherry profile, I believe, is stronger up front than what the description given above says, but that in no ways takes away from the rest of the scent profile. Indeed, to me, it adds to it. If this was a pure tobacco scent I'd be comparing it to RazoRock's Tobacco #1 and #2(I have both), but I can't, because in my eyes, SteamBath has just stepped ahead of those two in terms of scent. I'm also a sucker for anything that is scented or flavoured as cherry so that helps haha But really, this is a great scent that I can see myself enjoying from the start to the end of the tub! Performance: This is a little more interesting, since I can't think of a soap I have used to compared the way this soap works. The soap itself is very, very soft, even before I added water to it I could easily push a finger into it. Um... again using RR as an example, since that is fairly soft, the SteamBath is even softer, nearly a cream in consistency as just touching it left some of it on my finger without pressure. Before my shave I bloomed the soap while I showered as I always do, when I was finished I use the bloom water to wet my brush before I load my brush. It loads quickly, and I think it's the softness of the soap that helps in that, it loaded the brush fast and blooming just allows more of that amazing scent to escape. Now, as you can see by the pics below I lathered up in my scuttle, there is a reason for that but I'll come to that later. While it loaded easily, lathering takes a few more moments and I find the soap can be a water hog, could have been my scuttle was too hot, but I added much more water than I do with other soaps. 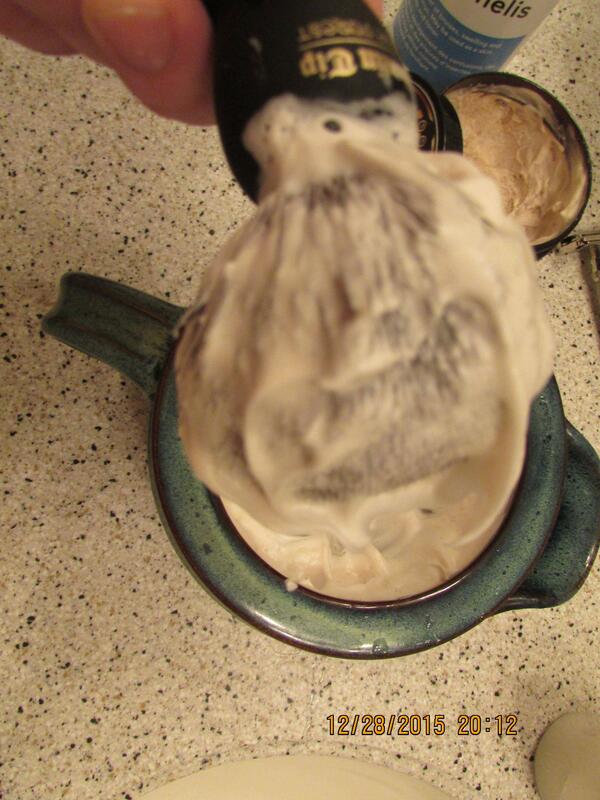 But, wow, the creamy lather that was created, um, what can I compare this to... Oh! Chocolate moose I think would be a good comparison lol It's thick, creamy and very cushioning on the face. My Kai blade glided over my skin easily with no friction and my skin... I'll get that soon, but for now, it's not the soaps fault truly. Nice and thick and creamy! You can see the soap almost stretching as I pulled my brush away from the scuttle. Now, here's the personal part that had those bad points I was speaking of. This was my second time using this soap, I used it first on the 25th, since I finally was able to get it that day(it was a 'gift' I ordered for myself and wrapped with some other soaps lol) finally and try it. I faced lathered it that time, and, everything else in performance above applies, it works great but it's very thirsty. The problem is mine, as it seems I'm allergic to something in the soap I first felt a slight burning on my lips, but I figured it was some hot water so I wiped it off. By the time I was finished my skin was on fire, again, though, I didn't blame the soap I blamed my rushed shave and poor prep work. However, when I rinsed my face off of all soap, my skin was very red even on the places where I HADN'T ran the razor over, just the overlap of soap when I was lathering on my throat. Obviously this finally told me that it was the soap and nothing else that could have been the problem that was making my skin burn; at no time did my razor touch that part of my neck. Great review, thanks! You know, the same thing happened to me with the DFS LE soap. The first time I used it, I face lathered with a boar brush and it burned! The next couple times I used a synthetic brush and kept the scrubbing to a minimum, using mostly painting strokes (I never bowl lather) and it didn't burn my face at all. So I just chalked it up to really scrubbing it in with the boar being the issue. Shawn, thanks for the excellent review. Here's hoping there are no more problems and you can enjoy the rest of this soap. (12-28-2015, 05:18 PM)wyze0ne Wrote: Great review, thanks! You know, the same thing happened to me with the DFS LE soap. The first time I used it, I face lathered with a boar brush and it burned! The next couple times I used a synthetic brush and kept the scrubbing to a minimum, using mostly painting strokes (I never bowl lather) and it didn't burn my face at all. So I just chalked it up to really scrubbing it in with the boar being the issue. (12-28-2015, 05:30 PM)Freddy Wrote: Shawn, thanks for the excellent review. Here's hoping there are no more problems and you can enjoy the rest of this soap. Just wanted to make an additional comment on this! 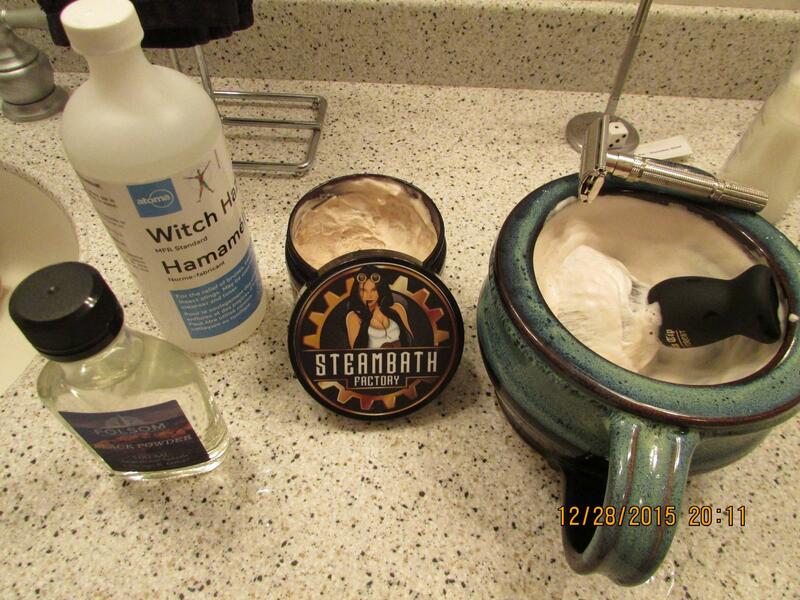 I just shaved with SteamBath's Bloodbath scent, which is a profile of pumpkins, dust, and black coffee. Once more I enjoy the scent, however I do much prefer the Wizard's Pipe as per my initial review. 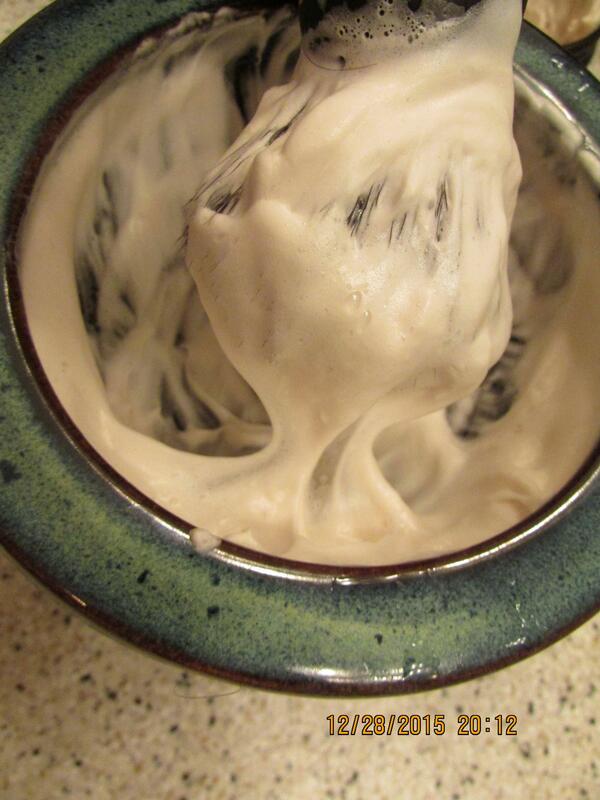 The soap performed excellently once more as well, I was afraid I had too much water in the bottom of my scuttle when I started, but it proved me wrong and absorbed the water, allowing me to make a nice, rick creamy lather for a great shave! Excellent review! I did have a jar of the Wizards pipe and I did love the scent and performance. This is by no means a down point of the soap, but when is a soap not a soap, but when its a cream. I certainly started out shaving with creams but I prefer soaps.